There are a lot of barrel aged beers around these days, but few of them are quite like this. For the 2018 GABS festival Stockade decided to go to another end of the spectrum to the 12 percent ABV super sweet maple-infused Mountie imperial stout which saw them win the People's Choice award at the festival the previous year. 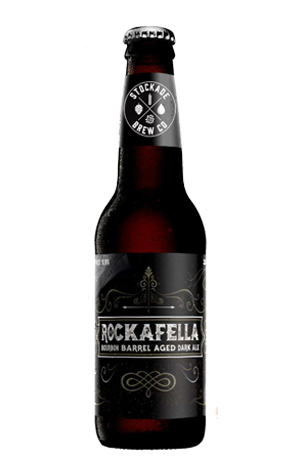 Rockafella is a 5.5 percent ABV dark ale that’s been aged in bourbon barrels. In comparison to most other barrel aged beers on the market it’s akin to barrel aged lite. Except it's not that because the bourbon flavour is as full as you get from a lot of beers twice its size – almost like someone slipped a few glugs of JD into the tank – which presents the major point of conjecture: that the lighter malt body isn’t robust enough to stand up to all that intense flavour. And that's true, in comparison. But take it on merit, for what it, is and you might just enjoy the way the little spicy kick of rye and sweetness of the crystal malt mixes with the raison, vanilla, oak and, yes, intense bourbon character. Rockafella is a beer that seems destined to have admirers and detractors in quite partisan camps. Some will appreciate the ability to be able to imbibe such flavours by the pint without putting yourself out of action for the rest of the evening. Others simply won’t be able to get past the expectation that such flavours should sit on a heavier body. Either way, it’s best to make up your own mind.